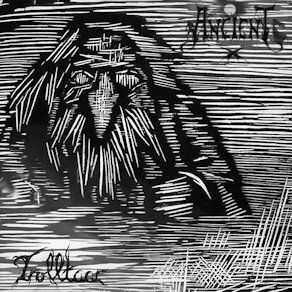 Ancient are a band from Norway that has been around for more than 20 years and played more of a raw and melodic style of black metal on this recording and this is a review of their 1995 ep "Trolltar" which was re-issued in 2017 by Sleaszy Rider Records. A very fast and raw sound along with a great amount of blast beats and tremolo picking starts off the ep along with some high pitched black metal screams and the riffs also use a great amount of melody along with all of the musical instruments sounding very powerful and clean singing can also be heard at times. In certain sections of the recording the music gets very atmospheric along with the songs also bringing in a great mixture of slow, mid paced and fast parts while the guitar solos and leads a re done in a very melodic fashion and a great portion of the tracks are very long and epic in length. Folk elements are also used briefly while one song adds in a brief use of acoustic guitars along with synths also being added into certain sections of the recording and they also bring in some demo and live tracks as bonus tracks which also display a more rawer style for the bands musical approach. On this recording Ancient played a more r aw style of Norwegian black metal which was a lot more different than the more mainstream symphonic or goth approach they took to later releases, the production sounds very raw and old school while t he lyrics are written in a mixture of Norwegian and English and cover Satanism and Occultism themes. In my opinion this was a very great sounding recording from Ancient and if you are a fan of 90's era Norwegian black metal, you should check out this ew-issue. RECOMMENDED TRACKS INCLUDE "Trolltaar" "Eerily Howling Winds" and "The Call Of the Absu Deep". 8/5 out of 10.